a creative momentum project is a €2m, 3-year (2015-2018) transnational project to support the creative industries sector across Europe’s Northern Edge. It is funded by the EU’s Northern Periphery & Arctic (NPA) Programme. Why is a creative momentum project happening? Creative industry entrepreneurs, artists and craftspeople working in the NPA area face challenges, such as limited networking opportunities and low export activity, because of their peripheral location. The creative sector contributes to sustainable regional and rural development and has potential for future growth. a creative momentum project assists creative entrepreneurs to address the challenges and sustain and develop their business. Who does a creative momentum project support? What does a creative momentum project do? get their products and services to market by supporting them to attend Trade Fairs and showcase their work online and to the tourist market. a creative momentum project conducts research on the processes operating in the sector to improve understanding of the sector’s needs and make the case for public policy to support the sector. How can a creative momentum project support be accessed? Creative Exchanges (information and networking events on a range of topics) held in all regions. MyCreativeEdge.eu to showcase their work internationally by creating a free online profile and also accessing new knowledge resources and networks. Creative Trails featuring any creative businesses open to visitors (Iceland and Northern Ireland only). Creative2Creative Matching: Online knowledge sharing with a peer in another region. Creative Steps 2.0: Innovation support for new product/service ideas. 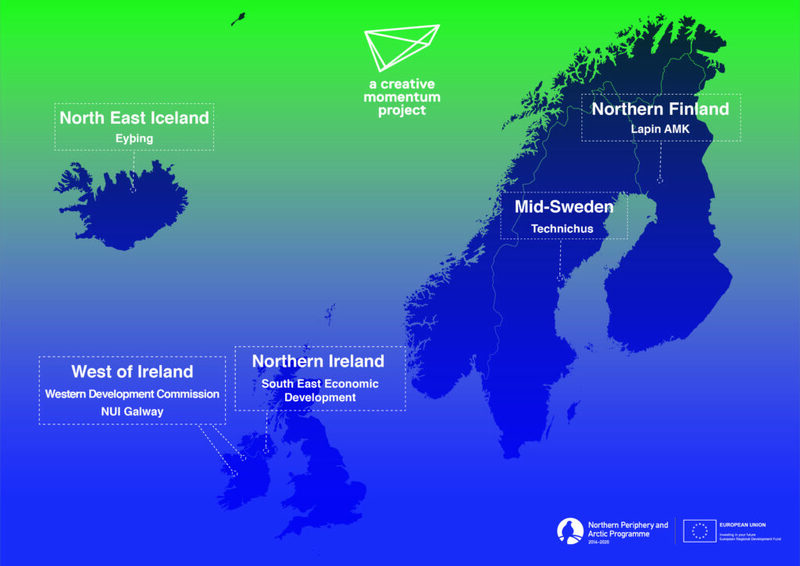 Creative Hotspots: Support to attend established creative industry events in Sweden, Finland, Iceland, Northern Ireland and Ireland. International Trade Fairs: Support to exhibit at a Trade Fair/Show/Festival anywhere in Europe (50% of cost, support of max. €2,500). Video Pitching: Support to produce a short ‘pitch video’ (50% of cost, support of max. €1,500). Who runs a creative momentum project?